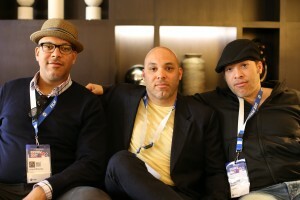 I met with first-time feature-documentarian Jairus McLeary, co-director (with Gethin Aldous) and co-producer of The Work, which just won the SXSW Grand Jury Prize in the Documentary Feature Competition, on Tuesday, March 14, 2017, at SXSW, along with his two brothers, Eon and Miles, both of whom were also producers on the film (which I also reviewed). 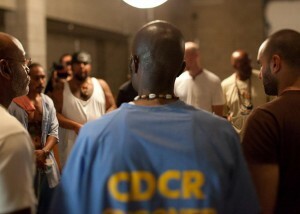 The movie examines, in intimate close-up, a four-day therapeutic workshop at California’s Folsom State Prison. We follow three men from the outside – Charles, Chris and Brian – as they voluntarily enter a special area of the prison to work with selected inmates, many of whom have previously participated in other workshops, to exorcise personal demons in a cathartic communion with other damaged souls. The result is a bracing look at therapy in action. Here is a condensed digest of our conversation, edited for clarity. Hammer to Nail: So I want to talk first about access, because you’re shooting in Folsom Prison. How did you get permission to film this movie in that place? Eon McLeary: Yeah, I was on the second training. In 2000 to 2001. HtN: When you say “staffed,” that means that you’ve done this workshop, yourselves? JM: Yeah, and that’s actually how we got into it, as civilian volunteers that come in. We did that, and I knew some of the guys who started it. They were friends of my dad’s and friends of the family and stuff. So we staffed and finally started to ask some of the guys who started it, and it took a little bit of time for them to say yes and trust us, and once they did, they got access to convicts inside, and those guys were some of the shot callers of all the gangs inside, and once they agreed, there was a little bit of a vetting process for the crew that came in. They all had to volunteer and go through the four-day training before we could actually shoot. And once the workshop folks met all the crew –and the crew did the emotional work with the convicts – they finally said yes. From there, we had to get access from the prison administration, and that was from the warden at the time. And then there was the administration that’s downtown, and once everybody signed off, we were able to come in and get access and try to plan a shoot. Miles McLeary: We had to navigate a bird-flu epidemic, riots that continuously break out there, so there’s no sure thing. HtN: I can imagine. So what drew you initially to the program, itself, before even wanting to make a movie about it? I mean, it’s a great program. But your three main subjects all seem to have certain needs beyond service, something that they want to confess, or confront. So what about you guys? JM: Essentially, our father has long done this sort of conflict resolution, and work that deals with cognitive-behavioral therapy, in a variety of different settings, and he would always ask us to come with him, as volunteers, as an experience that we could all do together. My dad asked me a few times before I said yes, because I said no, at first. He asked, “Do you want to go into prison? We’re going to be in a room with convicts. It’s Level IV [see here for description of prisoner security levels], and it’s just going to be us and them.” And I said no. And he asked me the second time, and I said no again. And by the third time, I realized that I knew nothing about prison beyond what I saw on television, and so by that time, I felt obligated to fill the void of what I didn’t know by going inside. And when I did, every experience was as much for me as it was for any of the convicts in the room. By the time you get to Day 4, you kind of just forget that it is a prison setting, and so I just kept coming back, staffed with my brothers, and at some point, one of the guys asked us if we would film it, because I was working in L.A. at the time, on independent films. EM: I basically just went out of curiosity, so it wasn’t like The Wizard of Oz, where I was looking for a heart, or whatever…(laughs)…My dad told me about it, and I trusted him and I knew I’d be with him, so I was like, “OK! Let’s check it out.” It was…terrifying. There was also less of a format, all the way back then, because they were sort of still making it up as they were going along. But it was an amazing sort of experience. That’s what kept me coming back. MM: I would echo the same sort of thing. I mean, basically what I saw was that no matter who went in or when they went in, they got their mind blown. So I knew that I was going to get something out of it that was profound. HtN: How then, Jairus, did you pick your three guys? Because they all end up in the same group. JM: We knew that we had to try and control the environment as much as we could, given that the word “control” inside a prison is kind of a laughable matter. There’s no way to control it. But whatever happens in that room – it’s a cinder-block room, maybe 50 by 100 feet – at the same time, you can hear stuff going on in the background. There are about 80 men in that room, at one point. So, we knew that we wanted to choose people that we’d staffed with before – guys from the outside – and it was easy to get a hold of those guys to see if they’d say yes. The convicts, themselves, had a vetting process, because this program is strictly confidential. This is the only place that those guys can talk about any of those things that they talk about in the room, or cross race lines or gang lines. If they do that on the yard, there are immediate, harsh repercussions. You can get killed for crossing those lines. So those guys, amongst themselves, after we talked to them, chose guys they felt were ready, guys who had sat in the weekly circles, which they do amongst themselves, as a vetting process, to get to one of these four-day events. They chose guys who are a mixture of really experienced guys who are shot callers and then new guys who would, for this one weekend, volunteer everything. So we didn’t really choose the convicts. We had a list, but they chose themselves. And then, when it came to the subjects, we had a group of people that perhaps we thought were ready. I’ve invited friends, cousins, my uncle – who is one of the guys who’s in the circle – it just travels through word of mouth, and once you talk to somebody … you can’t really explain what this is, and that’s sort of the purpose of why we made this film, because people would say, “What do you do in there?” And there’s just no good answer, in words, that describes the experience. So when it came to those subjects, we each really just picked a guy. I knew Charles, the bartender, as did they. Eon knew Brian for a number of years. And then he also knew Chris. And there was another guy we were going to choose, but Miles chose Chris. And for them, they didn’t know what to expect, just like any other person that we invited, so you kind of walk into that room and go, “What is this?” (laughs) But what happens is, you walk into that room and you experience what you’re going to experience and just kind of take it as it comes. There’s part of you that has to be ready for that. And so we chose those guys as placeholders for the audience. EM: I mean, the two constraints that we were up against were the room – it’s an echo chamber, so how do you capture all this? – and then resources. We were on a shoestring budget. We didn’t have rent to come back to. And so, initially, we thought of different ways of capturing everything and then doing what you were saying, sort of whittling it down, but we just didn’t have the funds to do that. It’s better that we didn’t. I don’t think it would have been as intimate. And so we had to make a decision, up front, to follow one circle. Jairus sort of explained how we chose the people in the circle, but that was really a function of what convicts in there can hold that space with cameras going at the same time. I’m not really sure how you suss that out ahead of time. I was afraid that that would be too invasive and shut the emotional part down. Because I’ve done it and I really can’t imagine going through the most personal sort of experience and having a camera over my shoulder. MM: I would also just add this. As Jairus said, we also needed our crew to participate. HtN: They had to be trained, as well. MM: Yes, before they could come in, as crew. HtN: And how big was the crew? MM: (looking at brothers) Was it 5…or 6? JM: Yeah. There were two camera guys, Art Santamaria and Matthew Rutenberg, and then two sound guys, Thomas Curley – who just got an Oscar two years ago for Whiplash – and his brother Brian was a boom operator. We didn’t really use the boom op so much in the room, but when we were doing stuff outside – interviews, and the footage leading up – he did that. And Joe Wigdahl was the still photographer. And that was just our bare-bones crew, and all those guys had to go through and staff the weekend, so that they could meet the convicts and also sort of get a sense of what the problems might be, trying to shoot inside that room. MM: So that, with all of us, makes nine crew members, that all had to come through. Jairus, actually, had to do the convincing, and it’s not really easy…(laughs)…to get someone with no background to come and go through this experience just so they can participate as a crew person. EM: With no promise – because we didn’t even have the funds to shoot, or permission, at that time – that there’s going to be a movie. So it was just like, “This is how we have to roll, at this point.” Because there were guys who went through who were potentially going to be crew who didn’t end up doing it, just because of logistics. But they all sincerely got the experience. Our camera guy, after he went through, gave us his 19-year-old brother and said, “Take him up there the next time you go.” And that was the first time we met … (laughs) … he came up, jumped in our car, we drove up, he was in our hands, and he had the same experience. HtN: The catharses that the men go through are so violent. It’s this incredible release of emotion, and there’s pile-on, as in a rugby match, jumping on the guy to keep him down. The ones that we see are all manageable, but we hear screams from other groups, off-camera. Were there any moments, that didn’t make it into the film, that were, perhaps, too explosive, maybe from another group? Did anything get out of control? Does it ever get out of control? JM: No. They’ve been doing this for 20 years and the prison is very clear – although they don’t always know or see what’s going on in the room – that they get the effects of it out on the yard. Shot callers drop out of the gangs. So the yard becomes safer. There are lower incidents of violence between the guards and the inmates. But nothing ever gets out of hand. One of the guys who started the program, Don Morrison, and this a direct quote from him, has said, “There’s nothing that 10 men cannot handle.” And a lot of this stuff is just masculine work, and this is what it looks like when you’re dealing with guys who have been used to violence as a way to solve problems in their lives, and those guys are watching the circle, they’re watching each other. If something gets violent, they all jump in and stop that from happening. A lot of this work sometimes has to be violent. It’s called psycho trauma, where you’re reenacting events from your life, and some of those events may have to do with violence. But there are men there watching every moment, who jump in when they need to jump in. HtN: Well, gentlemen, thank you so much for talking to me. Good work on the film!